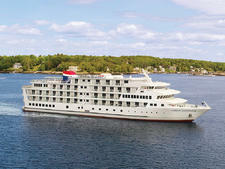 With American Cruise Lines' American Spirit, the name says it all. 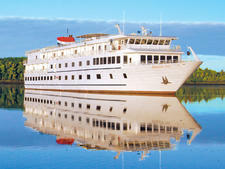 Operating exclusively along the U.S. East Coast, crewed entirely by Americans and built on the Chesapeake Bay, this small, 100-passenger ship is about as American as they come. Exploring historic and scenic ports where big ships could never think of calling, it offers a comfortable and relaxed cruise for those who are interested in both the destination and a friendly, well attended cocktail hour. Onboard relaxation and beautiful scenery are pretty much a guarantee. Minimal entertainment and limited land excursions will leave active cruisers bored. 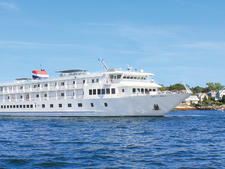 Good for older travelers who need a slower paced cruise experience. It isn't just by accident, or some patriotic fervor, that these ships bleed red, white and blue. Rather, a law entitled the Passenger Vessel Services Act limits the transportation of passengers between two U.S. ports to ships that are built in the U.S., owned by a U.S. company and registered in the U.S. Only a few companies are willing to brave the difficulties of flying the U.S. flag, and the experience on these coastal ships is very different from cruising on the Caribbean mega-ships. First, American crews, and American taxes, cost more, so the fares are high (we'll say that again -- you pay a whole lot more for an American Cruise Line voyage than you would for a typical seven-night cruise out of Miami.) Second, don't expect rock climbing walls or ice skating rinks; these ships are simple; cruising is stripped to the basics. Lastly, don't expect gracious, polished service from waiters with 30 years in the industry whose fathers served onboard the Normandie. Instead, you'll meet fresh faced college kids looking to do a contract or two while getting a chance to see part of the country. They are friendly, eager to please and receive pretty good training onboard, but this isn't their career. Don't be surprised if you are addressed as "sweetie" by at least one crew member, or if their knowledge of the menu is limited to, well, what is written on the menu. For many passengers, it probably feels like their cute but not-quite-grown-up grandchildren are serving them. 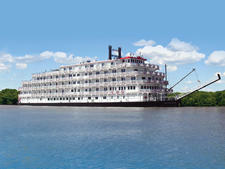 Other advantages, of course, are the wonderful itineraries along the East Coast. Imagine cruising Maine's rocky shoreline, watching lobsters being hauled out from Penobscot Bay early in the morning while a schooner sails by. Visit the former whaling captain of Nantucket one day, and walk to a lighthouse on Block Island the next. Enjoy the fireworks of oranges, reds, and yellows on the Hudson River fall foliage cruises while passing the US Military Academy. There won't be a casino or a 24-hour restaurant, but you'll get to venture inland and experience it all from an intimate, personal setting. So, once you've decided you can live without art auctions and "gold by the inch," why should you choose American Cruise Line over some of their competitors that offer similar itineraries? For most people, it comes down to the ships. 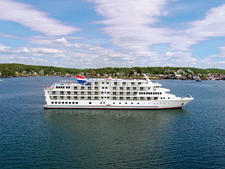 Launched in 2005, the American Spirit is a larger version of its 2000 and 2002 built running mates, the American Eagle and American Glory, respectively. The basic premise behind these ships is simple. 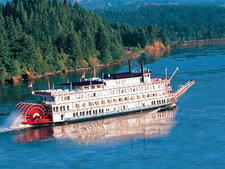 Small, American-flagged coastal ships have historically been hand-me-downs with tiny cabins and even smaller bathrooms. Enter American Cruise Lines, which built three modern ships, with more on the way, with a standard of comfort and spaciousness not found on its competition. Cabins are not only large, but many of them have balconies, and a choice of lounges means that everyone isn't always forced to be together in the only public space onboard. It also helps that all drinks are included and food and service on these ships is probably a step above most of their competitors, but it is the cabins that initially draw many passengers. Despite the comforts onboard, however, the real focus of the cruise is the destination with the ship merely acting as an agreeable means of transport between the ports. These ships were built to nestle into the smallest ports, and they take full advantage of this ability. Itineraries are designed to be in port every day and throughout the night, with only part of the morning or afternoon usually spent underway. Historic homes and museums make popular shore excursions, and a guest lecturer delivers eagerly anticipated talks. While the fares are running towards the luxury end of the market, don't expect caviar, room service and a decadent spa. 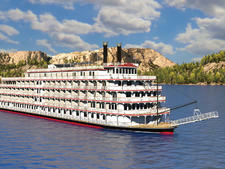 These are simple, but appealing ships with a friendly atmosphere of happy passengers traveling to quaint destinations. As evidenced by the company's rapid growth, it is a formula that seems to be working and keeps contented passengers coming back time and time again. American Cruise Lines attracts an older demographic, and the fact that all three ships have an elevator is a highlight for many. Hailing from Texas to California to Florida to Montana, they represent a true geographic cross section of the country and are interested in what the guest lecturer will say about wildlife, art, or the history of the region. 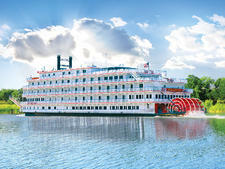 A majority of passengers are well traveled and have cruised before, but a large percentage have little interest in ever cruising on a big ship. 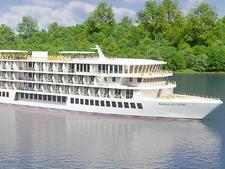 Others have sailed on the luxury lines and choose American Cruise Line for their itineraries. They know that while the food and service won't quite be comparable to the foreign companies, they will be comfortable and happy. With a high percentage of repeat passengers onboard, each trip becomes a family reunion of sorts as passengers recognize each other from previous voyages. 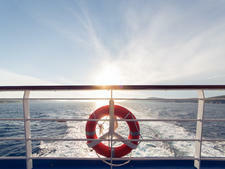 Once you've sailed, it is very easy to walk onto any of the ships and feel at home right away. American Cruise Line passengers are dressier than some of the more adventure-oriented small ships where shaving is optional and a fleece is the only jacket you'd find in the dining room. Instead, passengers are casual but still smart looking during the day. Most passengers change for cocktail hour and dinner, with only a very, very few sporting blue jeans for dinner. Most men put on khaki pants and button down shirts, and anywhere from 10 to 25 percent will wear a jacket (but rarely a tie) on a given night. There is no designation of formal or informal nights. Gratuities are recommended at $125 (about $18 per day; a bit higher than suggested for big ship cruising) for a seven-day cruise, and they can be charged to your onboard account.